Camping de la Plage is a lovely 3 star family friendly campsite that lies within 4.5 hectares of wooded grounds near to the highly popular seaside resort of Canet-Roussillon. The campsite has been extremely well landscaped with lots of trees and plants not only offering a degree of privacy but also offering a welcomed amount of shade from the summer sun. One of the best things about the campsite is its brilliant location. You are close enough to the popular town and seaside resort so that you can enjoy all they have to offer whilst being on the outskirts to avoid much of the hustle and bustle. You’ll also find a brilliant range of activities both on-site and also nearby which will keep even the most active family happy. Along with the fantastic location in regards to things to see and do, you’ll also find that Camping de la Plage, as its name suggests is next to a wonderful beach. Lots of golden sand, and a beach that is both long and wide ensure that you’ll not only have plenty of space in which you can relax but also plenty of space to play, swim and have fun. If you’re looking for a campsite with a great swimming pool complex, then you’ve come to the right place. 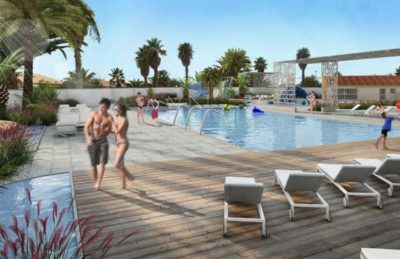 New for 2018, the swimming pool complex at Camping de la Plage is being completely renovated to keep visitors happy. Here you’ll find an extended lagoon styled pool, children’s pool, water slides and of course lots of sun terracing where you can sit back and enjoy the summer sun. Camping de la Plage campsite offers a comprehensive selection of activities and facilities on site and also nearby to ensure you have a fantastic family holiday. On-site activities at Camping de la Plage campsite include tennis, table tennis, badminton, basketball, volleyball, gym, archery, running track, mini golf, boules, windsurfing, cycle hire and a playground. Facilities available at Camping de la Plage campsites include WIFI, restaurant, takeaway, bar, groceries, animation team, games room, tv room, washers and dryers. Accommodation at Camping de la Plage campsite includes a range of 2 and 3 bedroom mobile homes that are available from Eurocamp.